The swinging doors on a PlexiDor look a little scary. Can my pet get stuck? No, pets don’t get stuck. 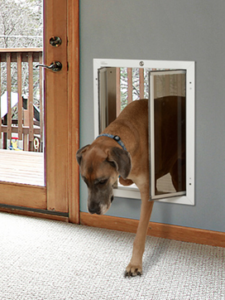 Even if the pet were to start going outside, turn, and go back inside with say the tail still in the door, the panels open so easily that the pet can’t get stuck. The PlexiDor has been on the market since 1985 without even one report of a pet getting stuck.